The Union of Lithuanian Art Photographers cooperates with the Russian Union of Art Photographers and the Belarusian Organisation of Art Photographers. The Union highly values cooperation with foreign colleagues. They use every photography festival or other art event to build cooperation relations, exchange exhibitions. They also participate in each other’s events or hold joint events. 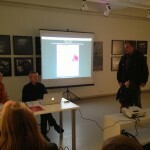 As a result, the Union’s programme of events always offers international exhibitions and lectures delivered by foreign artists in Nida seminars.